Ballymore was a manor and castle owned by the archbishops of Dublin in the 12th century. In 1373 Thomas FitzOliver FitzEustace was appointed constable of the castle, since then the town acquired the name Ballymore Eustace. There is no longer any trace of the castle, but here in St John's Church of Ireland are some superb reminders of our cultural heritage. Inside the early 19th century church is an effigy of a 16th century FitzEustace knight and two stone fonts, located in the graveyard are about a dozen 12th/13th century grave slabs, but probably the oldest monuments are the two high pre-norman high crosses. The north cross, pictured above left, is located directly north of the vestry. It stands 3.4 metres high and is comprised of three elements, the head, a shaft and a pyramidal base. The west face of the head bears a central boss with rounded moulding within a solid ring. The ring is banded by double rolled moulding. 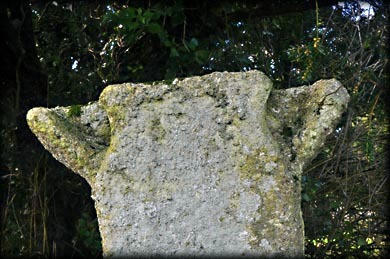 The cross, which is possibly 10th century, bears an inscription stating that it was re-erected in 1689 by Ambrose Walls. The centre of the east face is plain. The slightly tapered shaft features a single boss on the east and west faces. The deeply buried base is stepped. 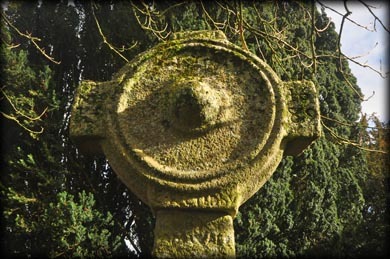 The south cross, above right, is hidden behind a tree to the south east of the church. The head and shaft of the, two metre high cross, was carved from a single piece of granite. Sadly most of the head has been broken off. The tapered shaft has rounded edges and a triangle at the bottom of both the east and west faces. The tall base has rounded edges with moulding. The cross is possibly 10th or 11th century. Situated: The crosses are located in the graveyard of St John's C of I Church, on the north side of the R411, at the east side of the town. Discovery Map 56: N 9325 0990. Last visit Feb 2018.